The public announcement that the IWMW 2014 event would be held, under changed management, was made on this blog on 20 January 2014. The following month the IWMW 2014 Web site was launched and the call for proposals was made. On 14 April 2014 the IWMW 2014 programme was announced. This was followed by a series of guest blog posts on Planning work: How can technology help the Workload Allocation process? ; Wake Up and Face the Digital Reality; Building Cost-effective, Flexible and Scalable Education Resources using Google Cloud Platform; I Do UX – Do You? and Rebooting MyEd – Making the Portal Relevant Again in which speakers at this year’s event have introduced their talks. Since the event takes place in less than three weeks’ time, on 16-18 July, it is timely to provide a further update on plans for the event. Although the plenary talks will provide a shared context for all participants at the event, an important aspect of the event are the workshop sessions, in which all participants should have the opportunity to participate actively, share institutional and personal experiences and concerns and engage in discussions and, perhaps even disagreements and arguments. I thought, the value of JISC projects was that they gave participants permission to think about education, in circumstances where this would otherwise have been impossible. It was this business of ‘asking questions about education’ which seemed curiously absent from the vision of the ‘new JISC’: it seemed that the new JISC vision is to think about keeping JISC going, not thinking about education. When explicitly asked about who in JISC was asking the ‘big questions’, the response given was “people above my pay grade”. In contrast to the changes in the Jisc environment, the IWMW 2014 event will adopt similar approaches to those taken at the Cetis 2014 conference: we will encourage participants to ask “big questions” and engage in conversations about the role of the Web in supporting institutional activities. Is content king? Should events ensure that their main focus should be on hosting proven quality speakers and ensuring the the event organisation runs smoothly? These are, of course, important. But at IWMW events we have felt that “communications, rather than content, is king“.We will be providing a number of workshop sessions which are designed to facilitate communications. But in addition to the formal sessions at the event we will also be providing a number of social events which provide opportunities for informal networking opportunities and discussions. On the evening of the first day, Wednesday 16 July, the workshop dinner will be held in the Great Hall of the Sutherland Building at Northumbria University. The following day a drinks reception will be held at the Great North Museum (Hancock). 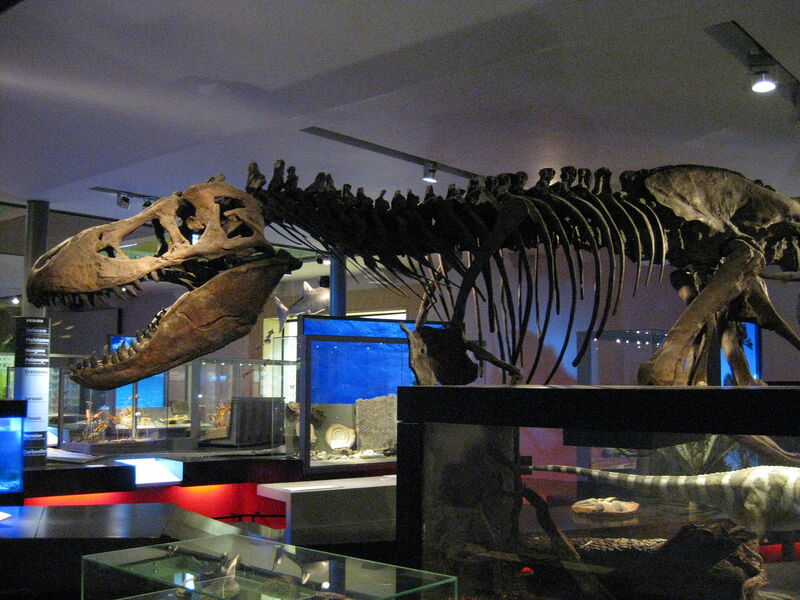 As can be seen from the accompanying image (taken from the Wikipedia entry for the Great North Museum: Hancock) we should be able to see the T Rex in the Dinosaur hall. Or perhaps participants will wish to visit the Elephant display. We will not grant participants permission to ask such questions: rather we expect participants to raise these and other challenging question! In brief, we will aim to provide high quality content with high quality organisation. But we will also provide a high quality experience for participants which will be based on the opportunities to interact with one’s and engage in discussions and debate. I hope to see you at Northumbria University in a few week’s time. But if you are intended to attend the event please book quickly as the official closing date is just a week away- Friday 4 July!